In 1965, Harriet Cohen worked with her husband Paul and his partner, Eugene Rosenberg, at what was then a fledging operation on North Main Street in Hartford, CT. Together, they worked around the clock to build their company. There were no vacations, no country clubs, and no amenities. The business eventually evolved into the largest sales organization of its kind, in the field of furniture industry liquidations. After years of hard work, the Cohen’s were finally secure financially, but instead of an ending, this is where the story really beings. In 2001, Paul Cohen underwent colon-rectal surgery, followed a year later with an esophagectomy at Massachusetts General Hospital. 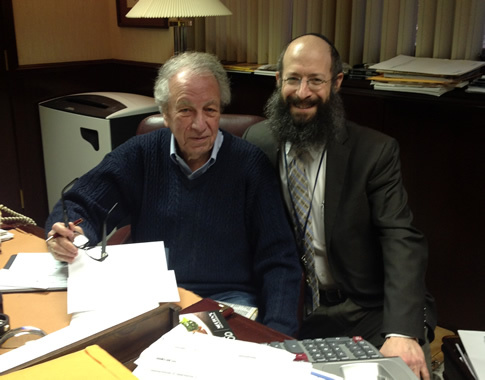 During Paul’s recovery, Harriet observed Rabbi Noach Kosofsky of the Yeshiva Academy in Longmeadow, Mass. visiting Paul on a weekly basis. The Rabbi could be seen wrapping Tefillin, reciting prayers, and offering hope to the Cohen family. Harriet thought the Yeshiva and the Lubavitcher movement was a group that simply read the Talmud and imbued Jewish children with a Hebrew education. She soon discovered another side – one of care and compassion for those who had suffered serious illnesses and setbacks. Harriet later carried out the meaning of the word Tzedakah. When the pathology report came back indicating Paul’s disease had been cured, Harriet, in concert with her husband, dedicated two rooms in the Hospital in appreciation of their two surgeons. The story does not end there. In 2006, partner Eugene Rosenberg suffered a brain aneurysm. Rabbi Yoseph Gopin, of the Chabad House in West Hartford, CT came on a daily basis, praying for his recovery. Miraculously, their prayers were answered as well. In May 2007, Harriet was diagnosed with cervical cancer. Again Rabbi Kosofsky was on the scene, always inquiring about her progress. Sadly, in March 2008, Harriet’s disease had spread, and she had less than two months to live. In her final will and testament, she bequeathed $100,000 to the Yeshiva Academy. It is through her loving act of kindness and generosity that the legacy of Harriet and Paul Cohen lives on in Springfield. Her gift has enabled the Yeshiva Academy, in existence since 1946, to continue its important and vital role in the community, to educate and imbue young children with a love of Yiddeshkiet.